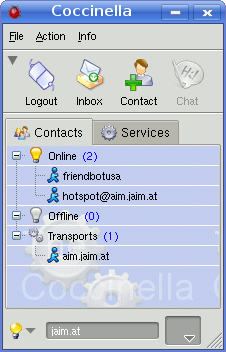 To add an AIM contact, press the Contact button. 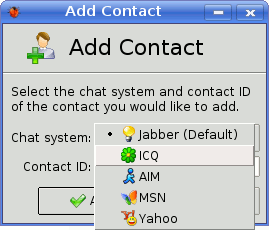 Select AIM as chat system. These steps are only for when you have not yet entered your AIM account in Coccinella. 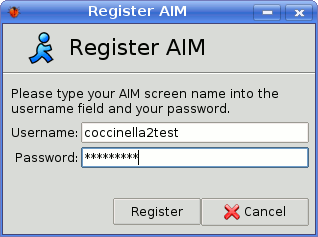 Enter your AIM screen name and password. Click on Register. Click OK to close the notification. Click Yes to allow your current AIM contact(s) to see your presence. 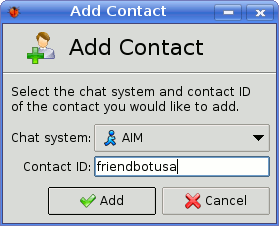 Enter as Contact ID the AIM screen name of your contact and click on Add. Normally, your contact wants to see your presence. You probably want to click on Yes. When your contact allows you to see his/her presence, you will be notified. Click OK to close this notification.